The appearance of a "sprite" (about 30 miles high by 30 miles wide), flashing above a distant thunderstorm. The "sprite" is about 175-250 miles away from the camera. MysteriousUFO sightings may go hand in hand with a puzzling natural phenomenon known assprites — flashes high in the atmosphere triggered by thunderstorms. 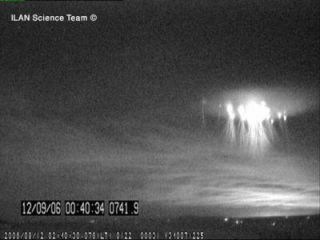 Thedancing lights have appeared above most thunderstorms throughout history, but researchersdid not start studying them until one accidentally recorded a sighting oncamera in 1989. "Lightningfrom the thunderstorm excites the electric field above, producing a flash oflight calleda sprite," said Colin Price, a geophysicist at Tel Aviv University inIsrael. "We now understand that only a specific type of lightning is thetrigger that initiates sprites aloft." Researchers have detected the flashes between35 and 80 miles (56-129 km) from the ground, far above the 7 to 10 miles (11-16km) where usual lightning occurs. Sprites can take the form of fast-paced ballsof electricity, although previous footage has suggested streaks ortendrils. Thecause or function of the flashes remains murky, but Price suggested that theycould explain some of the UFO reports which have cropped up over the years. Thatmight provide some solace for UFO enthusiasts disappointed by human-causedhoaxes in the past. Bothjetliner pilots and astronauts have previouslyreported sightings of sprites, along with a different but equallymysterious phenomenon known as blue jets. Priceand his colleagues have focused on "winter sprites" which appear onlyin the northern hemisphere's winter months. Their remote-controlledroof-mounted cameras can spot thunderstorms producing sprites far out over theMediterranean Sea. Triangulationtechniques have also allowed the researchers to calculate the dimensions of thesprites. "Thecandles in the sprites are up to 15 miles high, with the cluster of candles 45miles wide — it looks like a huge birthday celebration!" Price said. Spritesmay have some effect on the Earth's ozone layer, but researchers suspect thatthe global impact is small.